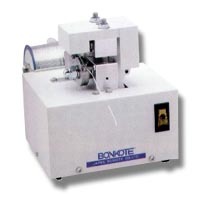 V ditch processing machine for solder wire. V Solder for prevention of solder ball dispersion. V ditch is processed just before soldering, so that solder balls are controlled without deterioration in the flux element. The flux that oozes out through V ditch is useful for the improvement of wet character. Combined use of LA method soldering iron, which has small temperature drop and capable of low temperature setting, stimulates the controlling effect further. Size substitution of solder wire from 0.5 to 1.6mm diameter can be done by exchange of guide pulley.